I remember everything…and I do mean everything about that day. It was a typical Tuesday in the Twiss household. I was fifteen; I said goodbye to my mom and dad early that morning and headed to school. My dad was scheduled to go to work, and he worked as a commercial airline pilot. There was nothing out of the ordinary. School was already in session at Pickens High School, the only high school in my small mountain town. I had settled into my seat in Health class, but it hadn’t been too long before the front office instructed all teachers to turn on the TVs in the classrooms. I always hate to admit this, but there was a large part of me that just believed that the plane had gone off course. Surely it was just a horrible accident, I thought naively. At least, that is what I wanted to believe. We were watching the gray smoke billowing out of the tall tower. It didn’t occur to me that there were hundreds of thousands of people who worked in the building. I didn’t think about all the lives that were in danger. And I certainly didn’t think about our freedoms that were in danger. I was in denial; at the moment, I wasn’t sure what type of significance this plane would have on the rest of my life. And then the second plane hit as thirty fifteen to eighteen year olds watched, completely helpless and absolutely terrified. My stomach sank. This was no accident. Tears began to well up in my eyes. I grieved for the loss of those in the planes and buildings, and on a personal level, I couldn’t tell which airline had hit the towers. Cell phones were not allowed on campus, and a rule follower to the core, I kept my cell phone in my car. I didn’t know if I was allowed to go outside and make a call, but I desperately wanted to know if my dad was safe. Our relationship had been strained, not too unlike any other teen girl and her father, but I loved my dad. I just wanted to be sure that he was ok. I wanted to hug him. I wanted to hear his voice. I wanted to make sure that we would have an opportunity to throw the softball one more time. And then the airlines were confirmed; my father was safe and all flights out of Atlanta and every other airport were grounded indefinitely. My dad was okay. And then I had a terrible thought; there were so many other teenage girls who wouldn’t get the opportunity that I was going to get to hug my dad again. It broke my heart. The student body was all abuzz the rest of the day. All of my male co-eds were making plans to join the military; all of my female classmates were terrified about what was to come in the next few hours. Four planes had crashed and far too many American lives were taken. Life, as we all knew it, would never be the same. Yes, I remember September 11, 2011. I will never forget watching helplessly as the towers crumbled to the ground. I won’t forget watching as the Pentagon was attacked, nor will I forget the story of heroism that occurred on United flight 93. We could no longer pretend that our country was impenetrable. We could only watch and pray for the families who lost loved ones. I went home and saw my dad on our back deck that was under construction. I had never been happier to see my dad. I wanted to hug him like I did when I was a little girl, but I had a friend with me so I played it cool. In my heart, I held more gratitude for another chance to see another day; and for another day to spend with my dad. And yet, I was deeply saddened for those girls who would never get a chance to see their dads again; for the wives who wouldn’t get to see their husbands; for the husbands who wouldn’t get to kiss their wives…all because they went about their daily routines. My question to you is, where were you on September 12, 2001? Our nation was united in our grief, but also in our admiration and respect for the rescue and relief efforts of our boldest and bravest. Even though we walked through the valley of the shadow of death, we had no fear, for God was with us. In the quiet, and the gray, and the silent, and the grief, we were reminded that there was a still, small voice that would comfort us in our loss, and strengthen us for the trials ahead. September 11, 2001 marked the loss of many great Americans. And yet, there was something special about September 12, 2001. We began to express total dependence on each other; and trust in our God though tears clouded our eyes and rubble dusted our streets. We were, all of us, willing to risk our lives for one another in the name of those who were lost. We were reminded that we live for something bigger than ourselves, and determined to fight for the freedoms that we had established in our great nation. It was something I hadn’t seen in my lifetime. I will always grieve the loss of innocent lives on that terrible day; but I refuse to believe that any of them died in vain. I will always remember September 11, 2001. 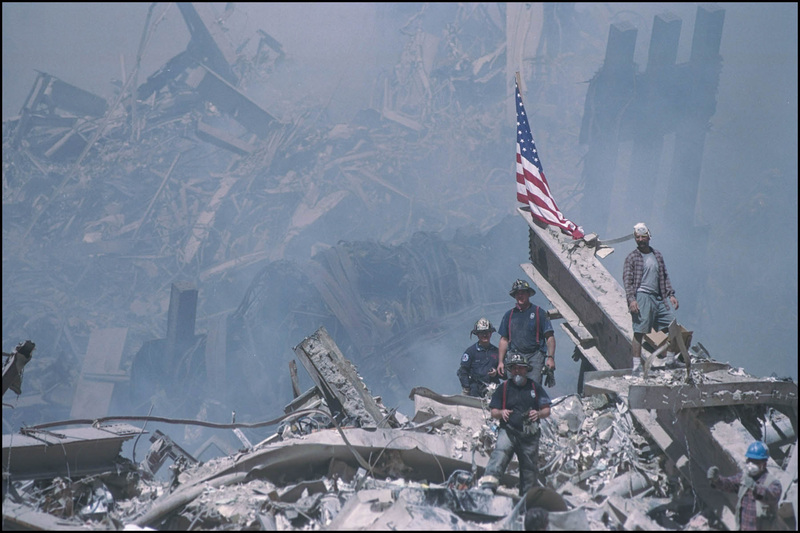 And I will never forget the resolve of the survivors on September 12, 2001. Beautiful post, Bekah. I, too, remember being in class and watching it all happen on tv. And thinking, “How are they going to get water way up there to put out the flames from all that burning wreckage?” Little knowing that those towers wouldn’t be needing water, as they would soon be coming down. I remember it like it was yesterday, and find it hard to believe that one day, I’ll have to explain it to my son, who will know nothing of this event.